Reading and share top 14 famous quotes and sayings about Good Governance by famous authors and people. Browse top 14 famous quotes and sayings about Good Governance by most favorite authors. 1. "Its gresham's law in operation is all walks of life and not just money: bad money drives out good money from circulation; bad writers drive out good writers from circulation, bad parents drive out good parents from nuturing, bad politicians drive out good politicians from governance, bad girls drive out good girls from heart, bad teachers drive out good teachers from classes....But bad emotions drive out good rationality." 2. "Good governance never depends upon laws, but upon the personal qualities of those who govern. The machinery of government is always subordinate to the will of those who administer that machinery. The most important element of government, therefore, is the method of choosing leaders." 3. "There never is a good time for tough decisions. There will always be an election or something else. You have to pick courage and do it. Governance is about taking tough, even unpopular, decisions." 4. "Gender equality is more than a goal in itself. It is a precondition for meeting the challenge of reducing poverty, promoting sustainable development and building good governance." 5. "Aid can work where there is good governance, and usually fails where governments are unable or unwilling to commit aid to improve the lives of their people." 6. "Yes, we have to seek redemption! Redemption from the divisive politics based on caste and religion, redemption from the corruption which is eating our lives like termites, redemption from misery of poverty, redemption from the sins of our venal politicians. We need good governance and accountability. An individual has to fight for the things he rightfully deserves. People do not need crutches of any kind if the basic conditions of nation are conducive to their growth. It's ridiculous; people are first deprived of basic amenities, denied their dues and then offered carrots to benefit the vote bank politics." 7. "This week, Zuma was quoted as saying, 'When the British came to our country, they said everything we are doing was barbaric, was wrong, inferior in whatever way.' But the serious critique of Zuma is not about who is a barbarian and who is civilised. It is about good governance, and this is a universal value, as relevant to an African village as it is to Westminster. If you are unable to keep your appetites in check, you are inevitably going to live beyond your means. And this means you are going to become vulnerable to patronage and even corruption. That is why Jacob Zuma's 'polygamy' is his achilles heel." 8. 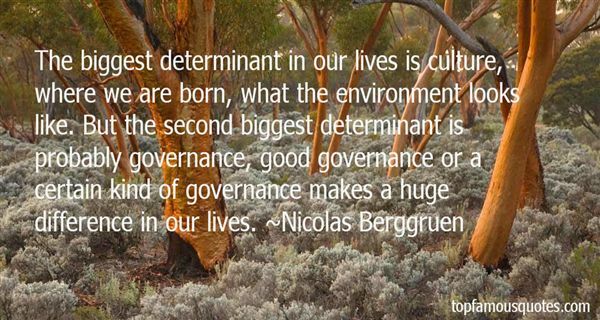 "The biggest determinant in our lives is culture, where we are born, what the environment looks like. But the second biggest determinant is probably governance, good governance or a certain kind of governance makes a huge difference in our lives." 9. "Corruption is the enemy of development, and of good governance. It must be got rid of. Both the government and the people at large must come together to achieve this national objective." 10. "India is known for its sobriety and wisdom, balanced and sensible thinking. We need strong institutions and we need good governance in the country." 11. 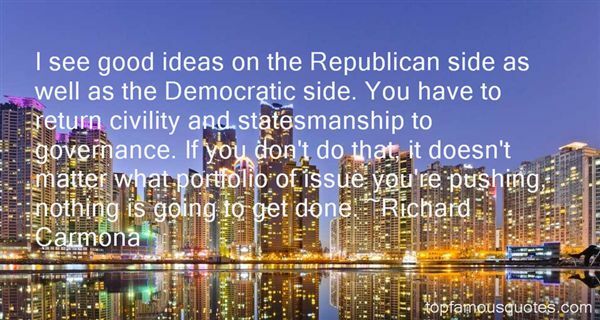 "I see good ideas on the Republican side as well as the Democratic side. You have to return civility and statesmanship to governance. If you don't do that, it doesn't matter what portfolio of issue you're pushing, nothing is going to get done." 12. "Everyone with all those good intentions came to help Indonesia rebuild from the tsunami; but the co-ordination problem was very big, because they came with their own way of doing business; they came with the inflexibility of their own governance." 13. 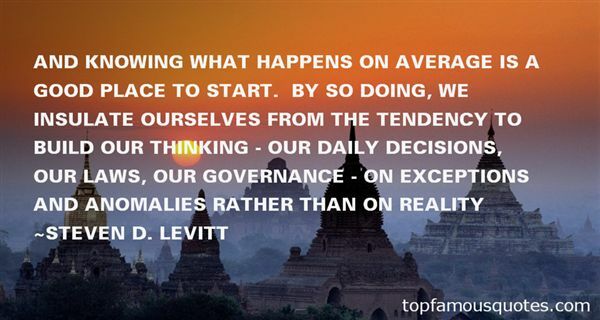 "And knowing what happens on average is a good place to start. By so doing, we insulate ourselves from the tendency to build our thinking - our daily decisions, our laws, our governance - on exceptions and anomalies rather than on reality"
14. "Good corporate governance, it's about being proper and prosper." We are the living links in a life force that moves and plays around and through us, binding the deepest soils with the farthest stars."